You would not want to run into this guy in the forest! 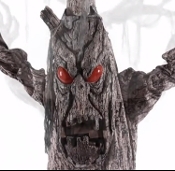 Wizard of Oz inspired 72-inch (180cm) tall animated living DEADWOOD HAUNTED TREE Character has sculpted face with light-up eyes, sculpted branches, and a moving mouth with sound! Printed bark fabric body gives a realistic look. He rotates at the waist as he says 3 different haunting phrases with spooky sounds. Great for any haunted house or Halloween costume party! Includes a UL adapter and a Try Me Step Here Pad. Functions include steady-on, try-me, or sensor mode. *Recommended for indoor or sheltered outdoor covered porch use only.